Established 1994. 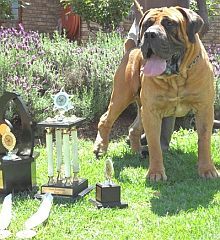 We breed to improve through temperament, health, conformation, character and agility. 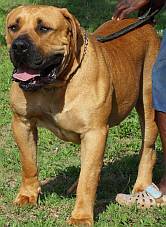 All our boerboels are SABT appraised, & tested for hip and elbow displasia. We have pups available regularly. 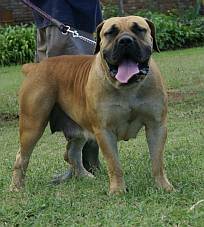 Boerboels have their own unique registration and the SABT handles it, each boerboel has to be appraised from a year old to meet the boerboel standard and has to pass a minimum of 75%; if not the offspring will not receive a birth notification to qualify for appraisal again. Each dog is accessed on its own merit - their offspring does not automatically get registration. We put breeding restrictions on our puppies. Each puppy has a microchip implanted before it leaves our care.